The features that I like best about IrfanView is that it is lightweight, yet capable of performing batch processing as well as slideshow creation. Undoubtedly, this is one good software to go, if you are short of cash to purchase expensive photo editing softwares. 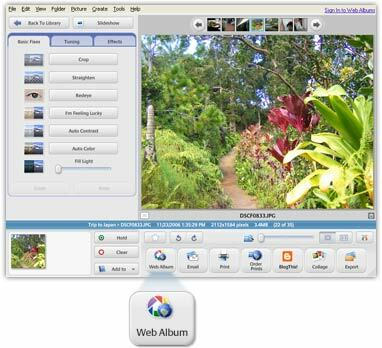 Picasa 2 was initially developed by Google three years ago and released as a free software. In spite of this, Picasa is still one of the most popular and useful photo album around to manage photos and pictures located in the PC’s hard disk drive. Picasa is not just a image library, it also include editing tools for enhancing photo images. For example, Fill Light is a tuning tool that brightens or darkens picture that contains dark backgrounds (e.g. someone with his back to the sun). Picasa is definitely recommended software of the week. You should have it as long as you have digital photos and purchasing professional softwares, such as Adobe Photoshop, become expensive. Picasa can be downloaded here. A complete new security solution aimed at securing database has been released by Symantec. Known as Symantec Database Security (SDS) 3.0, the software comes with new capabilities to curb the loss of sensitive information or intellectual property stored in databases. Some of the new features include intruder identification, real-time transaction policy alerts and integration with Symantec Security Information Manager (SSIM). SDS prevents fraud and leakage of sensitive data due to faulty practices and oversights, while addressing growing auditing, compliance, and regulatory requirements for secure data access. This software supports a variety of database software, such as Microsoft SQL, Oracle and IBM DB2.